The team will focus on actual payload performance tests, making sure each instrument is fully functional and ready to gather science data. This will include "first light" and calibration activities for the various instruments. In-flight checks of the New Horizons science payload are going well, as six of the seven instruments on board have completed tests proving they survived launch and demonstrated their basic functionality. Over the past month, spacecraft controllers at the Johns Hopkins Applied Physics Laboratory (APL) flipped the "on" switches for Ralph, Alice, LORRI, SWAP, PEPSSI and the Student Dust Counter and confirmed that the instruments' thermal control systems work, their computer processors boot up and run the correct code, and they can receive commands and send telemetry (or status data) back to Earth. The team will complete the set of initial instrument checkouts in mid-April when it conducts similar exercises with REX, which is incorporated into the electronics of the spacecraft's communications system. "The instruments are sending back a lot of housekeeping data that says they're working the way they're supposed to," says Mark Tapley, New Horizons science payload systems engineer from Southwest Research Institute. New Horizons Principal Investigator Alan Stern, also of Southwest Research Institute, adds, "The mission science team is just beaming to know that the entire payload survived the stresses of launch in good health." Through spring and summer the team will focus on actual payload performance tests, making sure each instrument is fully functional and ready to gather science data. This will include "first light" and calibration activities for the various instruments. So far, only the Student Dust Counter has passed this battery of checkouts, and is now collecting dust-impact data along the spacecraft's path to Jupiter. The first student-built instrument to fly on a NASA planetary mission, the SDC will detect microscopic dust grains produced by collisions among asteroids, comets and Kuiper Belt Objects during New Horizons' long journey â€" giving scientists an unprecedented look at how collisional debris is distributed across the solar system. 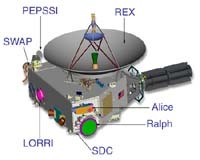 Full payload commissioning is planned to be complete by early fall, several months before New Horizons passes through the Jupiter system in February 2007. "The Jupiter encounter will be a real confidence builder, when we see how the instruments perform in a real-world flyby," Tapley says. It's been over three weeks since I last filed a PI's Perspective, so there is a lot to catch you up on. We're more than 60 days into flight now, and in every respect, New Horizons is doing fine.